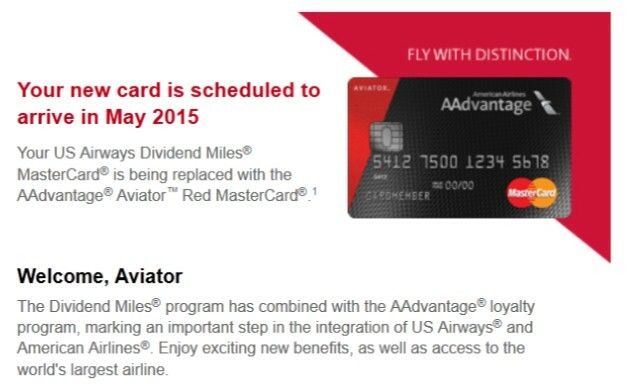 Now that the US Airways Dividend Miles program has been rolled into the American AAdvantage program, we’ll start to see Barclay’s US Airways Dividend Miles® MasterCards® being rolled into AAdvantage® Aviator™ MasterCards®. There are several types of the Aviator cards and just which kind you will receive will depend on the Dividend Miles card you had. In my case, I had previously received an email stating I’d get the AAdvantage® Aviator™ Red MasterCard® sometime this spring. Yesterday I received an email letting me know my new card would arrive in May. First checked bag free for me and up to four companions on the same reservation. This is a carry-over benefit. No foreign transaction fees. I don’t recall my USDM card having this benefit so if it’s new, it’s a great addition. 25% off in-flight purchases. Again, I don’t recall this being a benefit but it’s nice to have. 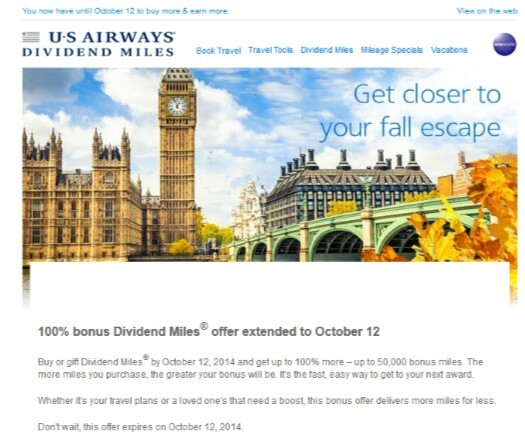 10% of redeemed miles back. This is definitely new and a terrific addition. 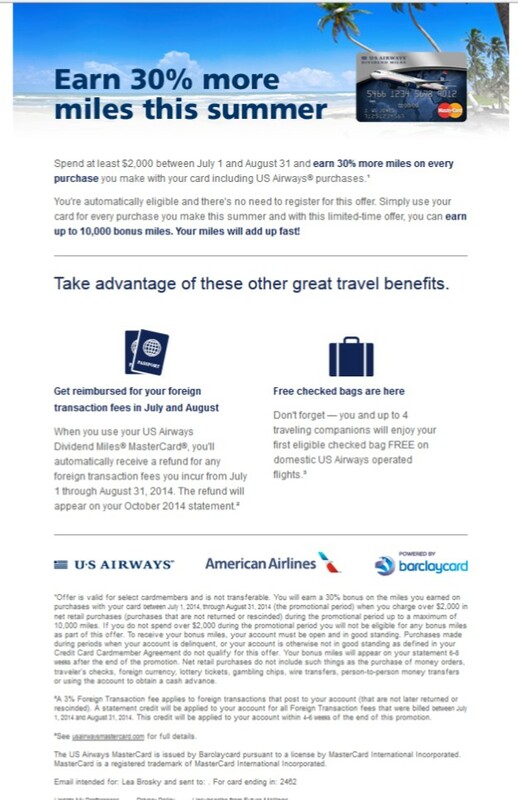 I already had this benefit via the American Airlines Platinum AAdvantage card but for those who don’t have that card, this can save you up to 10,000 miles per year, depending on how many you redeem. I actually maxed it out in 2014 for the first time. The email also reminded me to be sure I’d registered my card for the 50% bonus on eligible purchases from now through the end of June. If you haven’t registered your card yet, do so now by logging into your account and clicking on the promotional banner on the right side of the page. 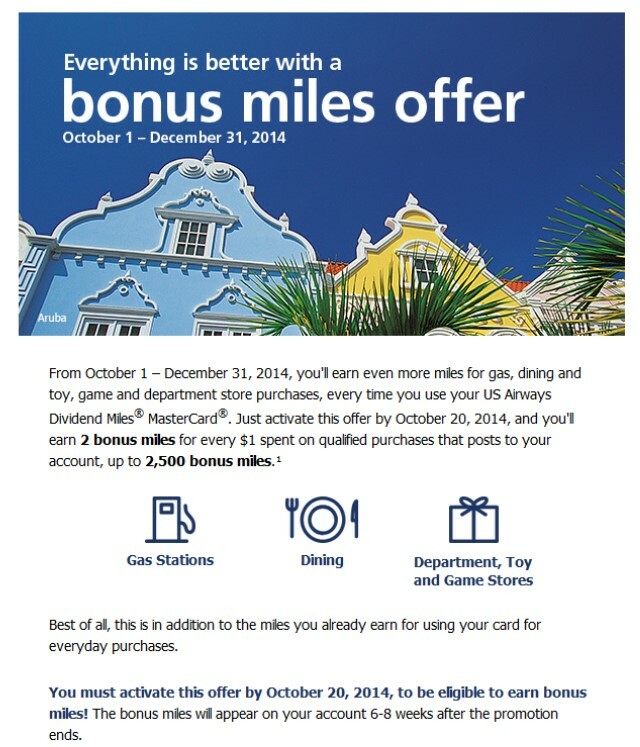 The US Airways MasterCard is running a special offer now through January 18, 2015. 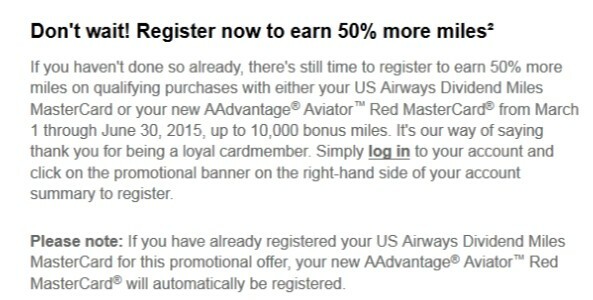 If you sign up and are approved, you’ll get 50,000 bonus miles and if you’ll allow me to refer you, I’ll also get bonus miles. 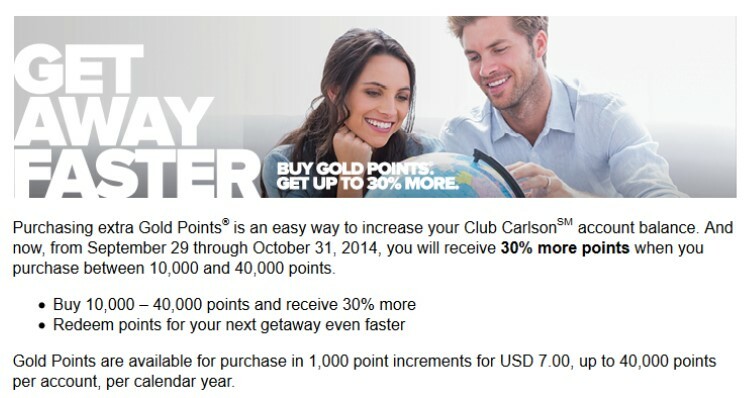 You’ll receive the miles after you make your first purchase and pay the $89 annual fee. And there are even more combinations to list! In addition, your first checked bag will be free, priority boarding and you’ll get a one-time companion certificate. If you would like to apply for this card, please send me an email at 2btraveling@gmail.com and I’ll be happy to refer you!